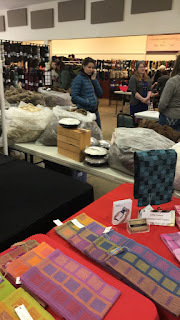 I ended up not sharing a booth with Laura who was going to sell roving so I made 2-ounce bumps from three pounds of our natural-colored Shetland roving with a sign inviting buyers to a "Mix and Match" spinning experience. I sold ten bumps and a friend from Arizona has said she'll buy all of my remaining colored roving, about three pounds. It's freeing and at the same kinda bittersweet, the end of an era. Don't get me wrong. 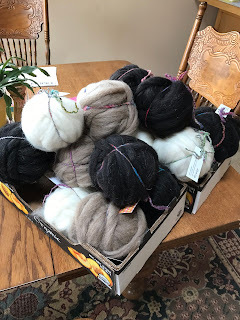 I have probably five bins of white Shetland and colored merino processed roving. I had two astounding experiences that day. One woman commented on my towels, asking me if I had gotten the draft from the Handwoven article a while back. I said that actually I had, that the pattern was mine, I’m the author. She got so excited, was happy to tell me that she got first place in her county fair using my pattern and that she had credited me. Goosebumps! A couple of ladies visited with me later, one was buying a tartan scarf, and the other, looking through my inventory asked me if I had sold scarves last fall at the guild’s Christmas sale. It turns out that she had bought an 8-shaft huck-lace scarf from me that she loves. She told me that the reason she just joined the guild was because she wanted to learn to weave like that for herself. More goosebumps!!!! 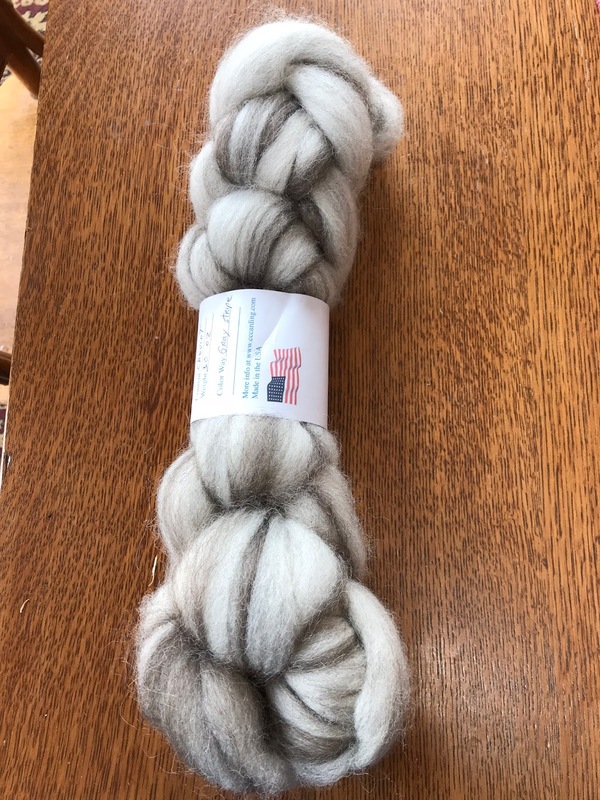 I surprised myself by buying this 3-ounce sliver of Cheviot roving. I'm actually interested in spinning again, just like that after such a long hiatus. I'll overdye it with Gaywool dyes when it's yarn. Oh, and I bought this too, a delicious 300-yard skein of 50% Merino, 25% Alpaca and 25% Silk. Once again I'm taking a break from weaving towels. I'd like to focus on what I learned in the tartan class and am playing it safe so far. This is the fiber challenge yarns in a Campbell of Breadalbane warp. I made mistakes and am so glad I chose a tartan that I know and also because I was warping from the front, I was able to make corrections while sleying. I'm at the threading stage but yard work is beginning to enter into my daily schedule. Yesterday was such a nice day that I planted about 60 winter bulbs that Ian bought from Costco last year and that I never got in the ground. I recently read that it's better to plant them than risk losing them. Two hours later I decided that was enough yard work for one day. 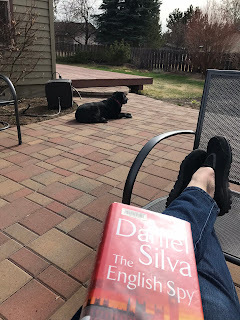 The day was still lovely so I checked the library catalog to see if they had a copy of the next Daniel Silva in the series I'm reading. They did so I trotted the four miles down to pick it up and devoted the rest of the afternoon to reading in the nicest day we've had this year. As you can see, books are high in my list of priorities. I just realized that my favorite Blogger app is working again so I’m sneaking in a post. The topic of our guild’s weave/study group this session is Color and this is our challenge, to be completed by November. We are to select three colors based on the first letter of our first, middle and last name. Each letter has four colors to choose from. I used Google Images to select the colors from my Tencel stash. The four cones on the left are sepia, sapphire, strawberry and salmon. The four middle cones are apple, amethyst, amber and aqua. The four cones on the right are cerise, cerulean, celadon and cinnamon, and I see in the preview that this app cropped the picture too. The cinnamon doesn’t show so I guess I’ll have to go back to Microsoft and wrestle my photos out of the iCloud after all. Oh, and we can add black and white if we want to. And just like that the app has stopped uploading pictures, alas. I can’t show you the photo of the three colors I’ve chosen so I will tell you that they are sepia, aqua and cinnamon. I used the Ruby Beholder and the aqua has a value on the gray scale almost equal to black. I’m going to weave them in the Campbell of Breadalbane tartan, but first I have to get through the Fiber Market Day show tomorrow in Prineville. The car is loaded for an early morning drive and I’m praying that it won’t snow! I just bought another Blogger app for my iPad so I’m flying blind on this post. Anyway, twelve weavers from the Central Oregon Spinners and Weavers Guild dragged our equipment the Diocesan Retreat Center on Thursday morning for a three-day workshop taught by Linda Evans. This facility is a former horse barn and more than roomy for classes. We arrived with prewarped looms. The morning was spent in lecture and we were rearing to go after a delicious soup and salad lunch provided by the Center. Each of us had chosen a tartan from the Tartan Registry and worked with Linda in advance on warping instructions. 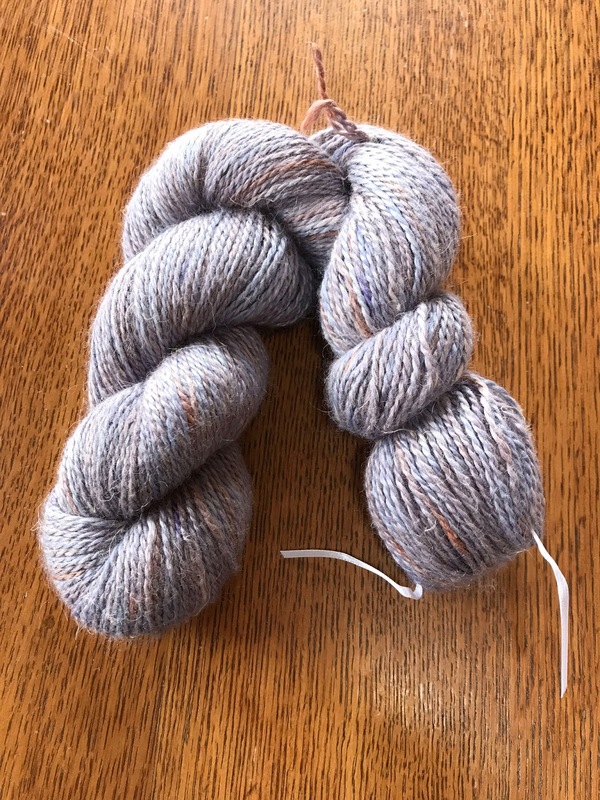 I chose Campbell of Breadalbane instead of Campbell of Argyl because it only uses four colors. I figured four colors and bobbins was plenty of challenge for my first experience with plaid. This is my sample and I was getting ready to start the scarf. I’m using 8/2 tencel set at 24 epi. Dean chose the McKay tartan since it’s a family name and he liked the colors. I do too! Believe it or not, this is a registered tartan. It’s called Rainbow and is a recently registered. There are two kinds of tartans, symmetrical and asymmetrical, and this is the latter. Linda finished it while we were there. I liked Patty’s Forbes tartan and was also surprised to learn that Forbes in a Scottish name, also Gaelic Irish. Linda mailed us all the information yesterday for all of our tartans and I printed out about a half dozen this morning until the printer ran out of ink. 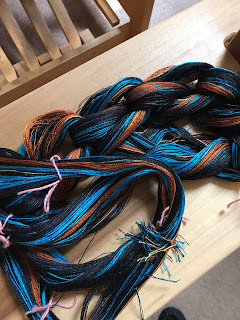 I made an account with the Registray and have gotten three threading counts so far and am looking forward to weaving other tartans, but for now I’ll be content to read and understand tartans with the thread order already printed out for me. I like this tartan too and think it would be a terrific Christmas scarf. I plan to weave scarves as working samples. One thing became clear to me - the more tiny stripes, the more fiddly it is and more time it takes to weave. Regardless, I’m hooked! Both Friday and Saturday mornings presented treacherous driving conditions, How treacherous? I drove the 18 miles at 40 mph and slowed to 20 to make the turn off the highway onto the access road and even in my Forester, the back end swung wide. I was wide awake when I arrived, and thankfully Marci, the Retreat cook who lives on a ranch just across the road, had strong hot coffee and warm nut bread waiting for us. I emptied the car yesterday after I got home, reorganized my work area so I could keep my loom up until I finish the Campbell tartan, and reorganized myself to head off for the St Pat’s party at the Bend Art Center - so many fun people I’ve met since I moved to Bend!! I almost forgot! I learned two weaving hacks from other weavers. I have always used film canisters but stuffed the excess yarn inside. Linda wraps her around the outside and then snaps the lid on to secure it. Donna uses these kumihimo bobbins with s-hooks but since I took these shower curtain hooks and washers, I weighted with them. When it’s time to advance the warp, you just pull the bobbin down and the yarn unspools - that’s all there is to it. So that’s now my new way to weight warp yarns separately. Every year I tell myself that I'm not going to get frustrated by the cold dark days of January and February but instead I will take that time to hunker down and read from the piles books I've accumulated, and this year I successfully did that. Here are some of the fruits of those two months. Christine wakes up every morning in an unfamiliar bed with an unfamiliar man. She looks in the mirror and sees an unfamiliar, middle-aged face. And every morning, the man she has woken up with must explain that he is Ben, he is her husband, she is forty-seven years old, and a terrible accident two decades earlier decimated her ability to form new memories. Every day, Christine must begin again the reconstruction of her past. And the closer she gets to the truth, the more unbelievable it seems. That's the publisher's teaser to what turns into a page turner. I'll say no more. I’ve found my enjoyment of Quindlen’s books to be spotty but I was captivated by this one from the start. The neighborhood setting was like a Petrie dish for a class study. I found the huge cast of characters hard to sort out and remember who did what so I finally jotted them down - very helpful. Nora’s fabulous museum job ends at about the same time and she ends up in a new field that has her writing a grant for a computer lab in a school that had relied on old desktops. When the principal began to cry, Nora did too. After all the years of asking rich people for money she realized how much more pleasurable it was to give it away where it truly was needed. Oh, for more Noras. The pace of the book is classic Anne Tyler. At least we see Nora’s character change and grow. This wasn’t the book I thought I was reading from the publishers blurb, which would have been about naive back-to-the-land survivalism without adequate preparations in the harshness of Alaskan winters. That would have been wholesome compared to the darkness that unfolded page by page and chapter by chapter to the point I wondered if I wanted to know how it all would end. But it is a story of the triumph of the human spirit and of friendships that matter, and it is indictment of our justice system that turns a blind eye to spousal abuse. And it’s an indictment of our military/industrial complex that inhales our “youngest and brightest” because after all, war is good for the economy, and then it spits them out at the other end. It’s a rough read and it’s worth it. Weeks later you'll still be thinking about it. Ian gave me this book for Christmas and while it wasn’t classified as suspense but it was a page turner nevertheless, unique in every way, an absolutely new and fresh novel with an 75-year-old protagonist set in Paris with it’s feet in WWII. Publisher's blurb: Seventy-four-year-old Jules Lacour—a maître at Paris-Sorbonne, cellist, widower, veteran of the war in Algeria, and child of the Holocaust—must find a balance between his strong obligations to the past and the attractions and beauties of life and love in the present. I am not drawn to thriller espionage fiction but I did love Chris Pavone’s book The Expats and requested a prelease copy from Random House based solely on his recommendation. I think it’s remarkable that the author packed so much into 300 pages, so many twists and turns and then more twists. And then some more. Vivian is a CIA analyst assigned to Russia. It’s a desk job and in that capacity she comes across some disturbing information that snowballs, threatens her family, threatens her children. Sound like typical thriller genre action? Not really and the further you read the faster you read. The ending. On man, I had to go back and read it three times and then shake my head. There had better be a sequel is all I can say. I took February off and hibernated, something I’ve always said I would do and then never did. It was a quiet reflective month and very restorative. I’m back in the game and happy for the time of refreshment. Last Sunday we attended the Asian New Year event, held in the Bend High School auditorium. There are so few Chinese in Bend that they can’t fill a program so include Hawaiian dancers and Taiko drummers, hence Asian New Year even though it really is the Chinese New Year. The program was wonderful and of course the Tai Chi school performances were spectacular. The meal in the high school cafeteria afterwords prepared was by the culinary arts students was also good, but sitting on those hard lollipop benches wrenched Ian’s damaged back and he’s had a rough week. I just spent three days at the High Desert Museum getting CIG (certified interpreter guide) training. I couldn’t see why we would need three full days but we needed that and more. Monday morning our trainer Carolyn sent us into the museum to see who our audience was at that moment. Attendance was sparse, mostly grandparents and small children. What I noticed is that the animals come out when the noisy children aren’t present. Note the dead quail at this feet - lunch. Jess, the associate curator of wildlife, was cleaning skat from his cage so he was waiting for her to leave so he could eat. A couple of offices had this sign in the door window. I can only imagine what’s on the other side. Even though Jess is staff, she hasn’t yet taken the mandatory CIG training which is only offered once a year. We were learning how to develop ten-minute talks that are both engaging and informative. I was the only one in the class from Living History. The rest were from natural sciences. It’s was a challenge to apply the principles to my application since we would never talk for ten minutes. Our information is delivered though Q&A. I’m still trying to digest what I learned - a lot! I got to pet a skunk! Her name is Daisy and she was raised as a pet but surrendered to the HDM by her owners when they realized just how much work is required to take care of her. We still have skunks here at our house but I’ve never been this close to one. Cinda told me this morning that she recently saw a skunk in our front yard. They will on occasion snack under the bird feeders in the middle of the night. We don’t want to stop feeding the birds so just don’t let the dog out in the backyard in the middle of the night. Most of the presentations were done in the classroom but Suzanne is a docent-in-training and so we went to the archaeopteryx exhibit downstairs for her presentation. That’s a rough one as she has a soft voice, the ceilings are high and it’s a public space, i.e., quite loud. I round it interesting that 12 people could be passionately drawn to 12 different subjects. Ian and I have wanted to get down to see this exhibit but haven’t, and now I find that it’s leave in a couple of weeks. Now I really want to see it! Ian’s son is flying in today so maybe that’s something we can all do together. I’ve taken on another new activity. Our church has several community-based activities, including the wood lot. These are the volunteers who run it on Saturday mornings, providing firewood to families who heat with wood but can’t afford to buy it. They serve about 50 families a weekend and will deliver to those who have no way to pick it up. I’ve joined the Community Garden group and we were just waiting waiting for the volunteers to finish their break before starting our meeting - so we could hear ourselves. We are just in the beginning stages, evaluating what was successful last year and planning planting for this year. We’re still a couple of weeks away from any manual labor, dictated by weather. My walking partner Cinda told me this morning that she’d like to participate so we will have another pair of hands. I’m looking forward to gardening with leadership from experienced gardeners. Today was the second day of a two-day workshop on Chine Colle, a collage-like technique that glues thin Asian paper to a print. It was taught by Anna McKee, a visiting instructor from Seattle. Yesterday I was totally lost and came home discouraged and confused. I spent two hours watching YouTube videos while we waited for our furniture to be delivered. I also found some material to read on the technique so today I was ready and mentally in the game. We were instructed to bring completed intaglio or relief prints so I decided to work with the photopolymer plates I made last year. This plate is inked and ready to print. It’s from a photo I took of boats in the harbor at Ilwaco, a place we visited on my birthday last October. This print is simply some torn blue gampi paper with a little supplemental blue ink. Chine colle is French for China and glue, so this is basically a technique that glues two papers together, an over simplistic explanation but I hope that makes sense. I reprinted it again but this time covering the entire image with beige gampi paper. I used kitakata paper for these two prints, a beige paper that produces this sepia effect. Each piece is cut to the same size as the plate and then printed/glued on a rag cotton paper for support. You would not believe how many Asian papers there are. I can afford machine-made papers. I cannot even begin to afford those made by hand. It boggles my mind. We were really overwhelmed by the bright blue pillows and have brought out our handwoven tapestry pillows for the loveseat. Maybe it’s just a matter of getting used to their brightness so this is the arrangement one day later. I love cobalt blue but after years of brown furniture I think I need to wean myself.